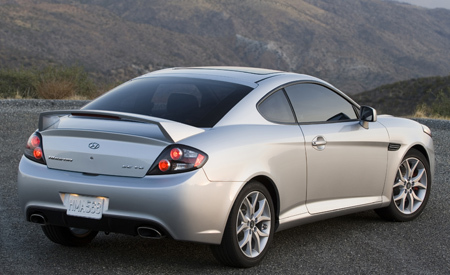 Hyundai are up to their usual tricks and are producing another facelift gen3 Hyundai Coupe, available early 2007. The Tiburon badged version will be changed to 'Tuscani', to unify the model name. However, early signs are that the UK will have a "Series III" badge. I quite like many aspects of the new Hyundai Coupe, for instance the new headlight shape is modern and striking, with the rear of car being in keeping with preferred styles of car modifiers. I note again some Celica-esque styling going on, for instance the 'slot' between the headlights, as the Gen1 Hyundai Coupe did with the Celica of that time. The 'mouth' of the car is a disappointment and harks back to the design of the original gen3 Hyundai Coupe- surely a more open grill would have been considered to be an improvement? ...Hyundai has unveiled the next rendition of its Tiburon coupe at the 2006 Guangzhou Motor Show in China. A new 2007 Tiburon will be available to Canadian buyers later this year. The new Tiburon features a subtle redesign while retaining styling elements from both first- and second-generation Tiburons. Canadian specifications and pricing will be available closer to the vehicle's North American launch"